Our 'Festival of Seasonal Music' took place in Towcester on two dates at Towcester Town Hall. 'A Ceremony of Carols' by Benjamin Britten was performed plus a variety of other carols. 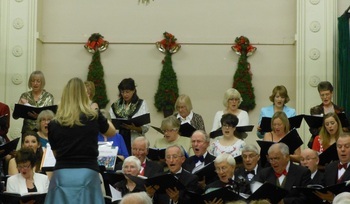 Our Musical Director, Helen Swift lead the choir with Tim Dolan at the keyboard and we welcomed Rita Schindler on the harp to enhance the enjoyment of the evenings for the audience. Towcester Town Hall was filled to capacity this summer as it resounded to tunes from Les Miserables, Shrek, The Lion King, Gone with the wind, Mamma Mia, Rocky, Breakfast at Tiffany’s and many more memorably films. Choir members were resplendent in their most glamorous glad rags and the Town Hall, too, was dressed for the occasion with red carpet and movie posters. Also performing were renowned musicians Velvet Brass and Canzon Brass. Sparking wine and canapés added to the festive atmosphere and a jolly good time was had by all. We were delighted to be asked to perform with renowned pianist Jonathan French and up and coming a capella group Chapter Five in the splendid surroundings of St. Mary’s Church, Banbury. The programme consisted of songs from films and shows, including Rogers & Hammerstein, Mamma Mia and James Bond. Over 30 people gathered in Towcester Town Hall on Saturday 9th February 2013 for the second in our series of workshops designed to help build musical confidence and improve singing technique. Led by our Musical Director, professional soloist Helen Swift, the students explored a variety of rhythms, tried out aids to pitching and indulged in improvisation. The braver souls were encouraged to try a solo. The day was great fun and ended with a short performance to family and friends to show off our learning.